Question: How accurate are planning frame drawings and what can we do to improve their quality? 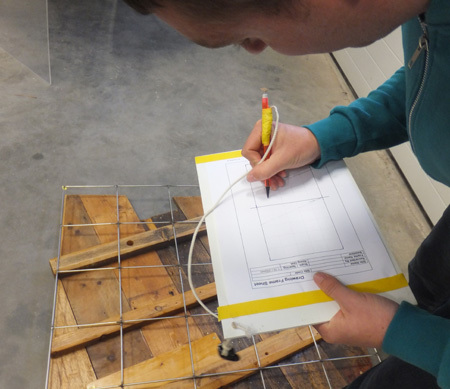 The aim of this test was to make empirical measurements to demonstrate the accuracy of planning frame drawings. 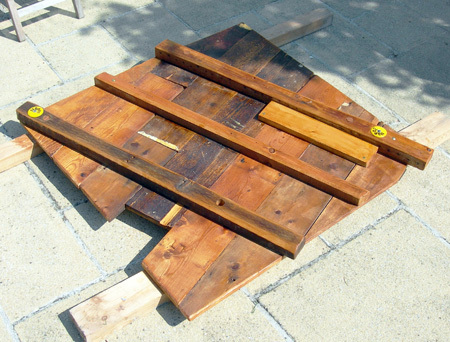 A representative timber test piece was constructed that could be recorded in the same way by a number of different people and the results compared with a known standard. 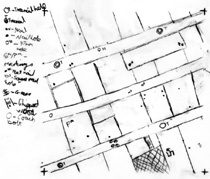 Different methods of recording were also tried using a planning frame and a sheet of clear plastic. 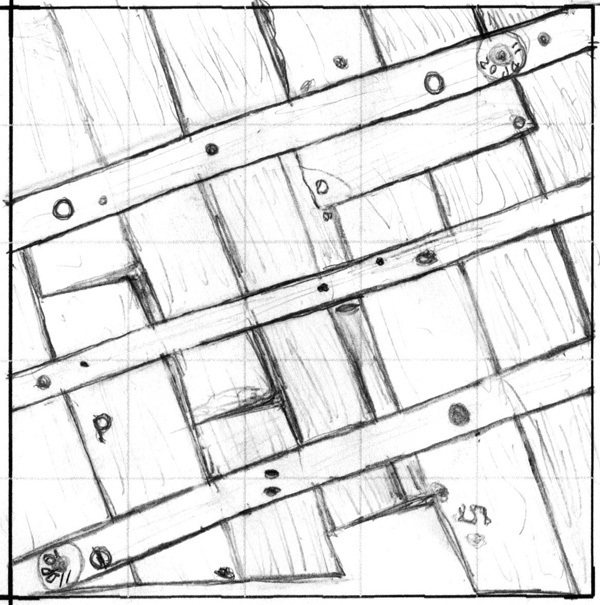 A 1m x 1m drawing frame test piece was made from scrap timber to represent the outer planks and three frames of a small boat (Fig. 1). The ‘planks’ were screwed to the ‘frames’ from the underside so the modern fixings could not be seen on the side to be recorded. 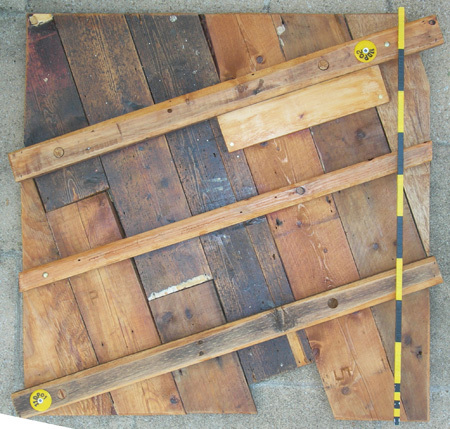 Interesting features were added to the piece; the end of one plank was omitted, some planks show signs of damage, one plank has a waney edge while details such as carpenters marks, trenails, nail holes and coach bolts were included. The test piece was made flat with raised frames as this would remove any problems with recording a curved three-dimensional structure using a two-dimensional recording method. 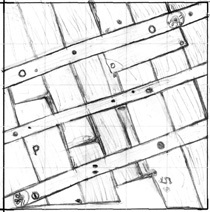 The frames were deliberately not aligned with the sides of the drawing frame to make the drawing more difficult as the lines on the frame would not align with the planks. 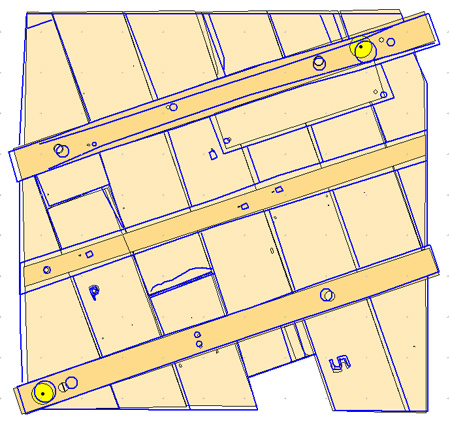 The test piece also had two yellow survey detail points added so the test piece could be used during survey training exercises. Once constructed, the first step in recording the test piece was to create a baseline standard image of the test piece that was as precise a representation that could be achieved to the tolerance required. To do this the test piece was photographed in a way that minimised distortions, the 'frames' stand proud of the planks so the piece was photographed at a distance using a low distortion zoom lens to minimise light ray divergence. The photograph was taken from directly above with the camera centred on the middle of the piece and using a flash to ensure even lighting. For each test subject the test piece was drawn at a scale of 1:10 scale using the same stainless steel mesh drawing frame (1m x 1m with 200mm squares) (Fig. 2) laid directly on top to minimise parallax errors. The drawing was scanned and converted to a TIFF image (Fig. 4). The reference image (Fig. 3) and scanned drawing were imported into Site Recorder as Drawing Frame objects. The reference image was correctly sized using a scale in the photograph and the scanned drawing was scaled using a measured distance between two known points. Both images were digitised using the drawing tools available in the program (Figs. 4, 5, 6), this reduced complex photographs to simple line drawings that were much easier to compare. Figure 3 is the reference photograph and Figure 4 shows the digitised and colour rendered reference image traced from it. 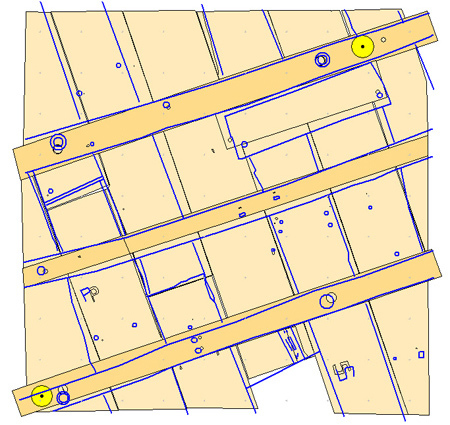 Two planning frame drawings are shown below, each were scanned and digitised in Site Recorder then overlaid on top of the reference image so the drawing (blue lines) could easily be compared with the reference (black lines). Drawing 1 was done by an experienced user. The majority of the features are recorded correctly apart from the middle 'frame' which is too wide and the rectangular 'patch' which is too large in size. 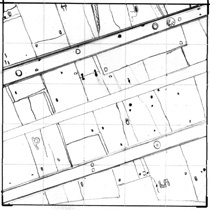 Pencil line thickness is approximately 6mm at this scale and errors in the drawn lines are in the order of 12-15mm. Drawing 2 was done by an inexperienced subject but the representation is surprisingly good. 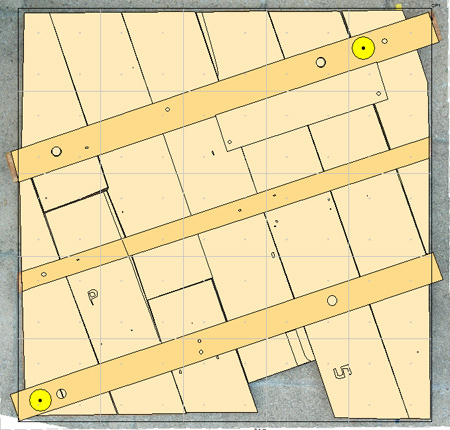 The largest positioning error is on one of the plank edges which is in error by 35mm. Repeating the test with different people doing the recording showed a large variation in the level of detail recorded and how the features were represented. The variation in the drawings suggests that an agreed way of representing features is required for any project to ensure that the same features are recorded in the same way. Next the timbers were recorded at 1:1 scale using a clear sheet of Perspex 1m by 1m in size and 6mm thick by the same inexperienced user that created Drawing 2. 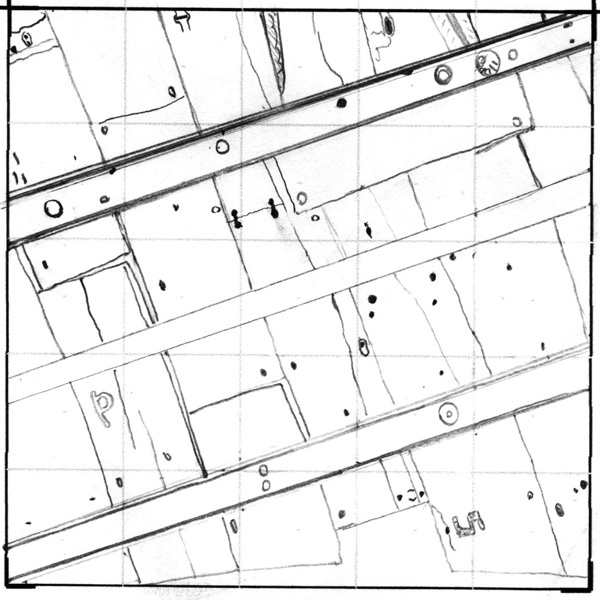 The Perspex was laid onto the timbers and their outline was drawn directly onto the plastic using a chinagraph pencil and a plastic rule (Fig. 11). A black pencil was used for the test but this was hard to see against the dark wood and yellow pencil has since been found to be more visible. The plastic sheet is heavy and would be hard to handle underwater in any surge or current. 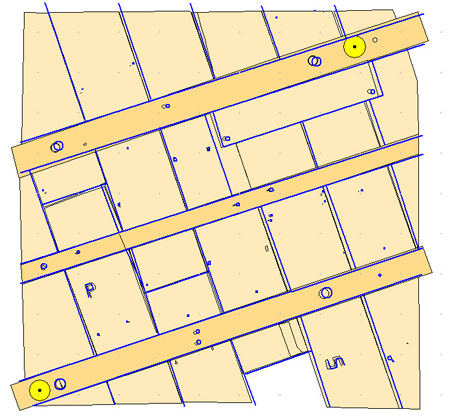 The plastic sheet tends to slide easily so it was necessary to start by recording a number of clearly identifiable features on to the sheet that could be used to re-align the sheet after it moved. When the drawing was complete the plastic sheet was laid on the ground on to a pale coloured backcloth and it was photographed from directly above. The photograph was again imported into Site Recorder and the features digitised. Drawing 7 (Fig. 12) is the digitised 1:1 line drawing by the inexperienced user shown over the colour rendered reference drawing. 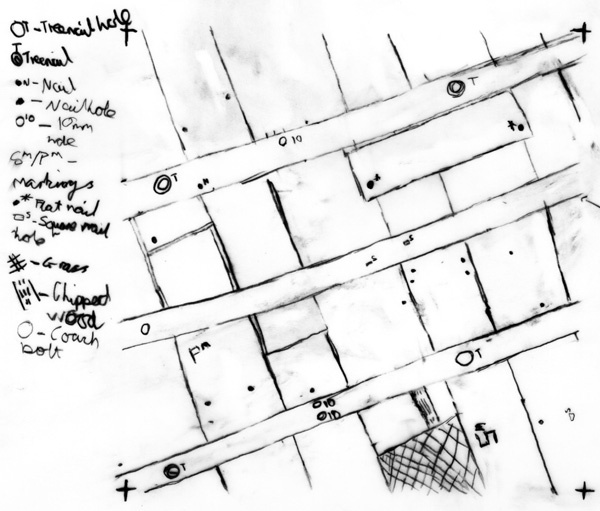 Here we can see a much high degree of correlation between the two drawings than was seen with the planning frame Drawing 2 (Fig. 6). In fact the plastic sheet drawing by the inexperienced user is a better representation of the test piece than the planning frame drawing done by the experienced user. Drawing directly over the test piece using the plastic sheet is easier than drawing to scale as you are simply tracing the edges that you can see. 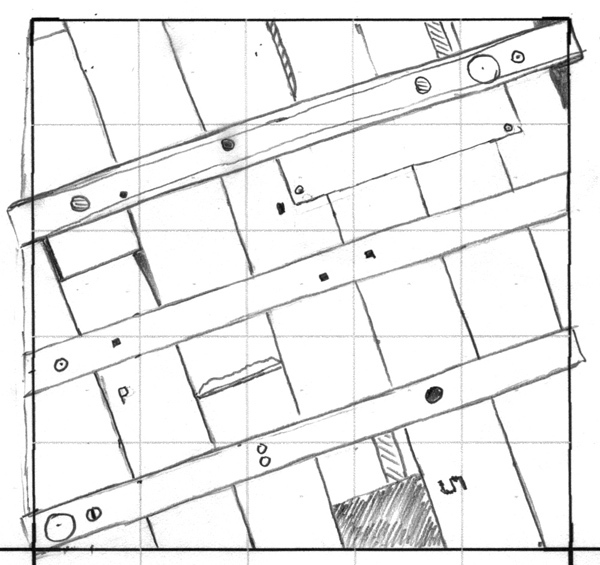 Also, any wobbles in the lines are far less pronounced at the 1:1 scale than they are at 1:10 so the overall quality of the drawing is better too. The drawback to the plastic sheet method is the logistics of getting the sheets on site and in position, retrieving them, copying then cleaning before they are used again. 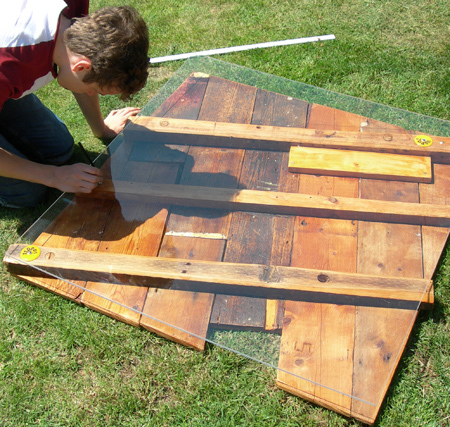 Suitable clear acrylic sheet can be expensive and how long they last in use in the field is unknown. As well as being more precise in inexperienced hands this method has another benefit when working in poor visibility. With underwater visibility of less than a metre it can be difficult to use a planning frame because you cannot get your eyes far enough above the frame and still see the features to be drawn. With the plastic sheet the drawing is made directly on to the sheet so the user can be much closer to it when tracing lines. In Drawing 2 the feature positions were in error to a maximum of 35mm.